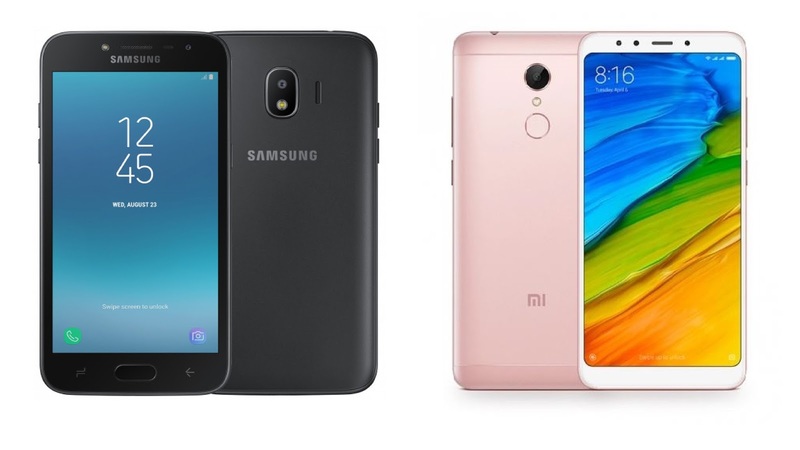 Samsung has launched 2018 Galaxy J2 in India priced at Rs 8190.Here's Price, Specs, Features comparison between Galaxy J2 (2018) and Xiaomi Redmi 5. Xiaomi Redmi 5 come with Metal body compared to Plastic on Galaxy J2 2018 It has a 5-inch (960 × 540 pixels) qHD Super AMOLED display whereas Redmi 5 has 5.7-inch (1440 × 720 pixels) HD+ 18:9 2.5D curved glass display. Galaxy J2 2018 is powered by quad-core Snapdragon 425 processor compared to Octa-Core Snapdragon 450 Processor on Redmi 5. Samsung Galaxy J2 (2018) comes in Gold, Black and Pink colors, is priced at Rs. 8,190.Xiaomi Redmi 5 comes in Gold, Black, Rose Gold and Blue color priced at Rs 7999 for 16GB, Rs 8999 for 32GB and Rs 10999 for 64GB. Xiaomi Redmi 5 offers Metal body, Fingerprint Scanner, better camera, Bigger battery, better processor compared to Galaxy J2 2018 priced at Rs 7,999.